I love food and really enjoy cooking. One thing that is a pet peeve of mine is a dull kitchen knife! To me, it is very hard to be efficient and get things prepped for a meal when you’re using a dull knife. In fact, it is easier to slip and cut yourself with a dull kitchen knife as opposed to a sharp kitchen knife. Why? Because with a dull kitchen knife, the blade can slip off the item you’re cutting and potentially slice your finger whereas a sharp kitchen knife will cut the item with more ease so there is no slippage. But don’t get me wrong, I have cut myself on sharp kitchen knives before but that’s usually because of user error or trying to rush through cutting something. Years ago, I had picked up a super big Calphalon kitchen knife set in a large knife block at the old Hecht’s/Macy’s for a fantastic discount! It was originally a $600+ kitchen knife set retail and with their super sale and added bonus coupons, I ended up walking away with it for $128!! It’s got so many kitchen knives and slots for extra knives too so I can grow my set through the years and that’s exactly what I did. After awhile, the blades do get a bit dull and with good knives, you still have to have them sharpened, preferably by a professional. One day back in 2007, I was browsing through on Amazon.com and was reading reviews on knife sharpeners and decided to give the Furi Kitchen Knife Sharpener a try. It was less than $30 bucks at the time and there were a lot of good reviews on it. No more dull kitchen knives again! It was so easy to do, I open up the Furi knife sharpener to expose the sharpening mechanism. The unit has a rubber bottom that grip well to my cutting board or counter so it doesn’t slide off while in the sharpening process. I firmly hold the sharpener with my left hand and I basically pull the kitchen knife towards me in its entirety from the base to the tip over the diamond fingers. 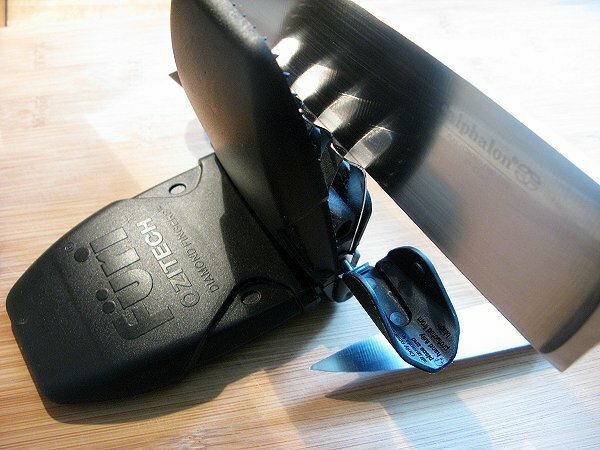 It’s designed so that both left and right handed users can use this unit just by flipping out the correct corresponding side for sharpening and grip. It is fast and easy to use and sharpens my dull kitchen knives in a matter of seconds. I love it and I love having sharp kitchen knives again. In fact, just today I sharpened a couple of knives before cutting celery, onion, and tomatoes and was thrilled once again over the joys of a sharp kitchen knife! And because the Furi Knife Sharpener is so compact in size and light weight, I often take it with me along with a chef’s knife in a case to other people’s house where I know I would be preparing food. That’s how much I love a sharp kitchen knife! And if they are nice to me, I usually end up sharpening their kitchen knives too since it’s so easy to do! 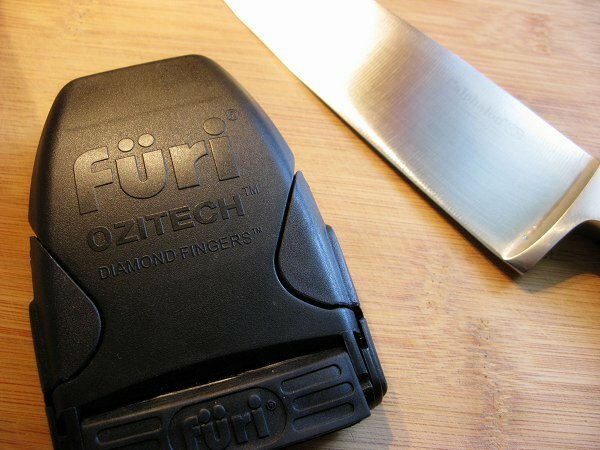 If you’ve never sharpened your knives in the kitchen, get a Furi Knife Sharpener and you’ll know the joys of a sharp knife as well!